Oporto is an absolutely beautiful and ancient city – two cities in one really, as it and the neighbouring town of Vila Nova de Gaia, just across the broad river Douro, are now seemlessly merged into one for all practical purposes. The Oporto side is the older commercial and residential centre, with ancient squares, wonderful churches, the stunning São Bento train station and plenty to do in terms of shops, sightseeing, restaurants and hotels. Vila Nova de Gaia’s major attraction is that it is home to the Port lodges, where a panoply of famous names can be seen across the water, atop cellars where millions of gallons of the world’s finest fortified wine rests and matures. 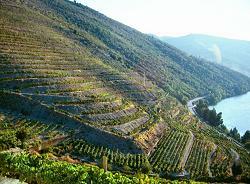 The centre of vine-growing is many, many miles further up the Douro river however, in the baking inland valley where gorge-like cliffs rise from the river, meaning vineyards are planted on terraces carved into the rock.Oporto is a charming old city, with many historic buildings along its hilly streets and public squares. Some are adorned with beautiful examples of the distinctive blue and white tiles, none more glamorous than the railway station of São Bento. The 12th century Cathedral is also well worth a look, with shady cloisters and Roman choir, and lovely elevated views of the city from the square. There are numerous wine shops in which to browse, and excellent coffee and pastries are available everywhere. A short stroll across one of Oporto’s bridges takes you to the Port lodges of Vila Nova de Gaia, where visits are offered Monday to Friday, often including short films and tastings. The cool, shady cellars are full of atmosphere. You’ll find all the big names welcome visitors, mosty free, and usually with no need to book in advance. In Oporto it has to be the new Oporto Carlton (left). The Carlton, opened in 2000, sits bang on the river in a building which is part of a Unesco World Heritage Site, but is really chic and modern inside. The lovely, luxurious rooms have fantastic views and huge bathrooms. It can be noisy at night because of the lively square outside, but has a superb location with panoramic views of the river and Port Lodges opposite. It is also just a two minute walk from the main bridge connecting the twin cities, which also happens to be the most beautiful: the Ponte de Luis, a 19th Century iron masterpiece, designed by Gustave Eiffel. Prices start at about £95 per night, per room (Tel: +351 22 340 2300). The Carlton is a terrific hotel that other wine-pages’ visitors have raved about following my recommendation to stay. Hotel Infante de Sagres is a very gracious old lady, according to a contact in the wine trade who stays there often, and is extremely comfortable with antiques and an air of old-world charm. It is slap-bang in the middle of the action of Oporto’s shopping and business centre. Rack-rates look rather high, with doubles starting at 200€, but according to my source lower rates can be negotiated and 130€ or so (£90) is what you should expect to pay. (+351 22 339 8500). The Holiday Inn at 2038 Avenida da Republica over in Vila Nova de Gaia has a good reputation for modern accommodation, though without much character. It is good for budget travellers though, with rates as low as £40 per night for a double room (+351 22 379 60 51). With its never-ending coastline, Portugal is, not surprisingly, also a great seafood and fish-lover’s destination. Casa do Marechal on the main Avenida de Boavista (+351 22 610 4702) is one of the top fishy places in Oporto. It is an elegant destination that won’t break the bank at around £20 per person for dinner. One of the city’s trendiest restaurants (where the food was also really very good indeed) is Don Tonho, on the Cais da Ribeira (tel. +351 22 200 4307). Sitting across the river from the Port lodges of Villa Nova de Guia, Don Tonho is frequented by visiting pop and film stars (Oporto’s Ivy? ), yet is moderately priced. I enjoyed some very good tapas-like dishes early one evening, many of them seafoody, at a table by the large picture windows. The Solar do Vinho do Porto is a bar/tasting room with an incredible list of Ports by the glass, and a delightful terrace. This is run by the Port Wine Institute, so prices are low and the views from the garden terrace looking down the river transform beautifully through dusk into darkness. The Solar is open late, and is at 220 Rua de Entre-Quintas. It is an easy day’s excursion to travel from Oporto early morning, and spend a few hours exploring the stunning scenery of the Douro Valley before returning for dinner to the city. However, this area of vine growing and ancient white-washed Quintas is so magnificent, that you may well decide it is worth lingering for a day or two. You can travel the twisting roads by bus or hired car, or take a boat trip from Oporto during the summer months.Twice a week one of Europe’s last steam trains makes the trip from Oporto to Pinhão and back, though there is a regular train service too. From the town of Régua onwards, the railway hugs the river and offers one of the world’s most scenic train routes. The main centre for visitors is the little town of Pinhão (Peen-yowh), which serves the basic needs of visitors to the vineyards and the Quintas. The upper Douro is a place for meandering slowly by car, on a boat, or on walking routes, and taking in some of the world’s most beautiful vineyard scenery. It is not the Napa Valley, or other wine tourist trail, and has very little by way of fancy restaurants, accommodation and attractions. This is peaceful, unspoiled and rugged country. 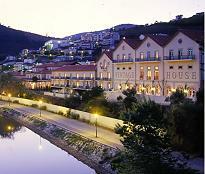 Having said that, Pinhão has a lovely hotel and restaurant called The Vintage House (+351 25 473 1600). This very plush old hotel is a member of Relais &amp Châteaux, and is magnificently placed, with a terrace garden restaurant commanding views down the Douro. Rooms are medium-sized but very well appointed, and not as expensive as you might think at around £80 per night. The food is great, and served with a lot of style. My lunch here on the terrace was a highlight of my trip.Some people might feel the need to get closer to the vineyard action, and several Port houses have cottages or rooms on the Quintas (farm estates) for rent. You can try a booking service such as manorhouses.com, or try one of the individual producers with accommodation, such as Quinta de la Rosa. This is in the northern suburb of Matosinhos. It is the ultimate insider restaurant and the very best fish place in town. Very simple, with excellent dishes particularly grilled fish. They don’t accept reservations; one has to go there early, (otherwise always full). An ok wine list, with simple wines (but they do have Niepoort rosé, white and red!). It is not easy to find, and there is not even a sign at the door to give its name – or tell you it is a restaurant! My thanks to Dirk for these recommendations. I am looking forward to a return visit to this area soon, with a few days in Oporto and another trip up the magnificent valley of the Douro river. It is unquestionably one of the world’s most breathtaking scenic journeys.